1. Endorse your favorite brands and products and get access to unprecedented rewards. I suggest Endorsing Safeway, Target, Walmart & BestBuy to start! 2. Shop at the stores or buy the specific products you Endorse. 3. POP your receipts into the pre-paid mailer (like Netflix), stick it in the mail, and get your cash back. **You are automatically mailed 2 envelopes when you sign-up. 4. 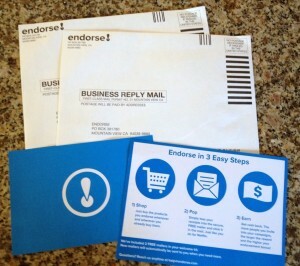 Invite your friends to follow your endorsements and POP, they’ll earn 10% cash back too. If 5 followers POP your endorsement, you’ll get the endorsed product or entire store purchase for FREE. Endorse works through a Facebook app so you must have a Facebook account. The 10% cash back is after coupons & tax. The “Five & Free” program will give you back an average of what your friends spent. So if you spend $500 and each of your 5 friends spend $10, you will only get $10 not $500. You can only earn cash back on purchases after you “endorse” them. As of right now there is no limit to the amount of cash back or the amount of “five & free” earnings you can receive. You will receive a check in the mail after you have earned $25 in rewards. Sign-up for Endorse Now! You can also head over to read their FAQ’s.